.. Smooth, fastest, slickest, nearly impossible to stop foosballs . 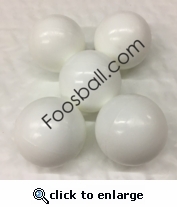 1 3/8 inch diameter slick white or red foosball. These are the balls provided by the current TS manufacturer. They are more slippery than the original TS balls used on the tour in the late 70's. .. Quantity is for one ball.